As All Hallow’s Eve draws closer I feel compelled to pass along a couple of ways you can while away the evening and have a ghoulishly good time. Here they are! 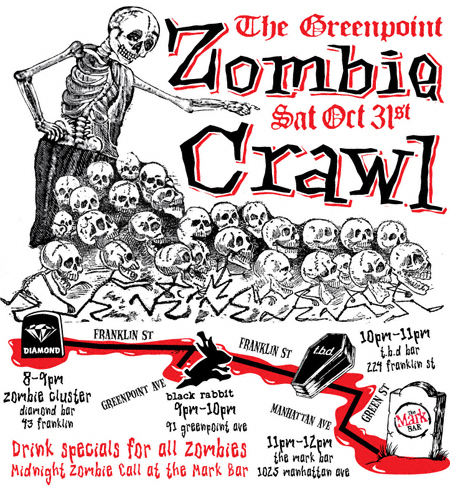 Greenpoint’s very own Zombie Crawl will kick off at 8:00 p.m. at the Diamond Bar. Judging from the parade of festively fettled (and intoxicated) zombies that besieged my block last year, I’d say this is the thing to do. NOTE: there will be drink specials at each participating bar for those who are clad in zombie attire. Just steps away from the Mark Bar, Tommy’s Tavern (AKA: “the murder bar”) will be having an evening of “blood, guts and shakin’ butts” starting at 10:00 p.m. Now I dare any of you not to get behind that! October 31, 2009 starting at 10:00 p.m. Blood & guts/shakin’ butts?… Don’t get me started!